With the popularity of Fahrenheit 9/11 and Super Size Me, it would be understandable for documentarians to think that in order to have a successful, hard-hitting film, they need a compelling on-screen personality. 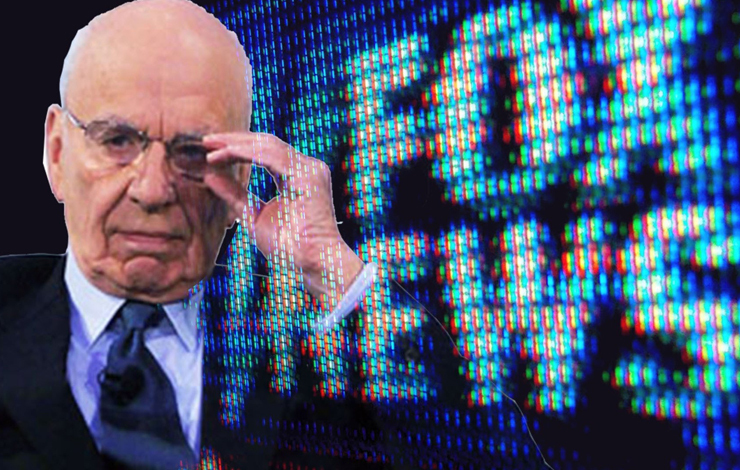 But with Outfoxed: Rupert Murdoch's War on Journalism, Robert Greenwald has shown that it is possible to make a powerful and popular film the more traditional way—investing thousands of hours monitoring a subject, obtaining leaked documents, finding and interviewing whistle-blowers and, perhaps most noticeably these days, staying behind the camera. Meticulously monitoring Fox News for many months, Greenwald uses its own footage (without its consent) to expose their attempted illusion of objectivity. It was through telling the story that wasn't being dealt with in the primary media in his previous film, Uncovered: The Whole Truth about the Iraq War, that Greenwald saw the need for Outfoxed. The footage is supported by leaked policy memos purportedly sent to the whole Fox News operation by John Moody, a news vice president, as well as the disclosures of seven former Fox employees (three of whom disguised themselves to protect their identities). While it's no secret that Fox is a conservative network, Greenwald was surprised to find that "Fox isn't just conservative, but partisan and Republican." Supporting this is the memo in which Moody writes of the 9/11 Commission hearings: "This is not ‘what did he [President Bush] know and when did he know it' stuff. Do not turn this into Watergate." Helpful in the making of a documentary about the deception of the media, the relative transparency of the filmic elements (the clips, interviews and memos) gives Greenwald his defense against detractors. He challenges people to go the core elements of the film, which, he says, are "absolute and concrete and cannot be dismissed as propaganda." One criticism of the film formulated in The Washington Post concerned the effect of selective editing. Howard Kurtz wrote that while Greenwald portrayed Fox political correspondent Carl Cameron as saying, "If you want to destroy jobs in this country, you raise taxes." The section that was edited out would have shown that he was, in fact, quoting Commerce Secretary Don Evans' criticism of Kerry's tax policies. But Greenwald eagerly points out that this accusation goes straight to the thesis of the film itself and what he was demonstrating. "They [at Fox News] only give you one point of view. It's not that I can show Carl Cameron quoting a Democrat praising Kerry's policies—it just doesn't exist. They go out and find sourcing for the point they're trying to make. And they confuse news casting and commentating." Yet the manipulative editorial aspect of documentaries can't be avoided. Greenwald himself says that while "you can't make this material something that it's not ...somebody else might tell a different story with the same set of facts." To find the film's participants who helped shape this story, Greenwald had to cast a very wide net. While he found many people interested in talking, quite a few were restricted by the non-disclosure agreement they had signed upon leaving Fox, while others were concerned about the possible damage to their career. The people who did participate, says Greenwald, "shared a belief in the integrity of the news that overruled the fear of the potential harm to their career." As a Hollywood director, Greenwald still has a business making commercial films. He took the obvious risks that come with making a documentary criticizing a media company by using its own footage, and as a precaution he retained the services of several intellectual-property lawyers on a pro bono basis. Due to the many hours of footage that needed to be analyzed and edited, Outfoxed was made in a uniquely collaborative way. And since there weren't models for making this type of film, Greenwald and his team had to "create a series of systems which would service the creative, rather than overwhelm it." Beginning in January, a dozen DVDs were set to record Fox News 24 hours a day, seven days a week for several months. From these tapes, Greenwald and his researchers developed a list of Fox's dissemination techniques that were repeated mechanically throughout the broadcast day. This list led to the film's organizing themes. Armed with the list, 10 volunteers assembled by Moveon.org monitored different time slots and when they found examples that substantiated the list, they alerted Greenwald via e-mail as to the time and place, which was then put into a spreadsheet. All the while he was creating a mental structure of the film based on the materials he was receiving. Outfoxed's team of five editors worked on Final Cut Pro in shifts around the clock and willingly accepted $150 a day to be part of the project, abandoning their going rates of up to $1,000 a day for commercial work. Using the spreadsheets, the night editors would find the flagged footage from the immense library of Fox News segments and digitize it for the next day, and the day editors would work simultaneously on different segments of the film. At the end of each day, Greenwald would review their work on a secure website. And the spirit of collaboration extends to Outfoxed's distribution model as well, using many of the same techniques refined with Uncovered. To help enliven the political debate, the film has been sold on the websites of groups working in media issues, such as FAIR, Media Matters for America, Common Cause and Media Reform. Alternet is offering the DVD to anyone contributing $30 or more to support its lawsuit to cancel Fox's "Fair and Balanced" trademark on the grounds that it's "misleading, deceptive, and notoriously mis-descriptive." And the film has also been presented at house parties and special screenings, such as one for Congressional members in Washington, DC in conjunction with the presentation of a petition requesting a meeting with Murdock to discuss how he can resolve his channel's partisan perspective. Outfoxed is also doing very brisk business on Amazon.com-and, in a sort of subversion of the traditional distribution sequence, has been screening in selected theaters across America through Cinema Libre Distribution, which has also been handling a new theatrical version of Uncovered. Greenwald sees the attention his films have been getting as an indication of their value in galvanizing people who care about social justice issues. "People are increasingly passionate about what a great tool these films are," he maintains. Greenwald continues to wield this tool with the third installment of the "Un" series, Unconstitutional, which premiered in theaters in late September, also through Cinema Libre. This film, produced and directed by Nonny de la Peña, deals with the erosion of civil rights since September 11, 2001. Jana Germano is a freelance writer covering film and media issues. She can be reached at janagermano1@comcast.net.